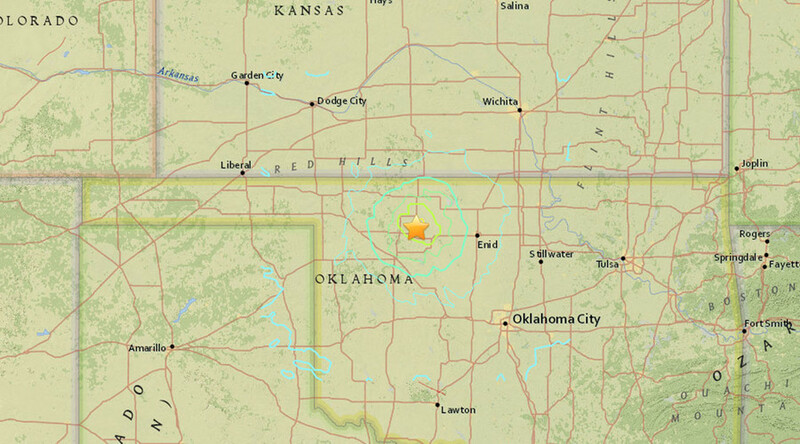 An earthquake measuring 5.1 in magnitude hit the US state of Oklahoma in the Midwest on Saturday, the US Geological Survey (USGS) reported. The tremor was registered just after 11 am local time (5 pm GMT). A 3.9-magnitude aftershock was reported 10 minutes later. The epicenter of the earthquake was located about a mile (1.6 km) beneath the ground some 95 miles (153 km) northwest of Oklahoma City, according to USGS. The town of Fairview was the closest to the epicenter, which is located 17 miles (28 km) away. Fairview, Oklahoma earthquake felt as far away as Omaha, Nebraska, near Chicago, IL and Green Bay, WI. Also felt in KS, MO, AR, TX, and OK. It only took 6 months but I finally felt my first Oklahoma earthquake!! Local KOCO-TV 5 television channel reported “several phone calls from people who felt the earthquake throughout the state,” but said the local police department had not reported any damage. The 5.1 earthquake was “probably the second largest in Oklahoma and the largest in this general area,” according to USGS National Earthquake Information Center geophysicist John Bellini, as cited by Reuters. The largest earthquake before today’s took place in 2011 and measured 5.6 in magnitude. According to USGS, most of North America east of the Rocky Mountains normally experiences earthquakes infrequently. In some regions, a “significant majority” of the earthquakes taking place recently are thought by researchers to have been triggered by human activities, such as mining and other of natural resource extraction that could be altering conditions in the Earth’s crust. It’s not immediately known if Saturday’s tremor is related to oil production activities, USGS’s Bellini said. In January, local authorities announced that nearly $1.4 million of the state’s emergency fund would be allocated to the Oklahoma Corporation Commission and the Oklahoma Geological Survey for seismic research at the request of Oklahoma Governor Mary Fallin, who said better understanding of what is causing the recent earthquakes in the state is needed.